Often, homeowners view pressure washing in North Royalton, OH as a magic wand. Their simple plan is to rent a pressure washer, aim it at the house, patio, fence or other grime-coated surface and – presto! – it will sparkle like new! While pressure washing is an effective method for freshening up the exterior of your home, it’s not quite that simple. If used improperly, pressure washing can damage your property, cause injury to the user and produce less-than-desirable results. If your home’s exterior has lost its luster due to dirt and grime build-up, washing your house is a great solution. However, it’s important to select the best method. Pressure washing is good for painted surfaces and concrete. For siding, stucco and stone, a soft wash system is best. This uses very low pressure and environmentally friendly cleaning solutions to gently restore your home to its original beauty. Choosing the right method will avoid potential damage to your home and will produce better sparkling results. 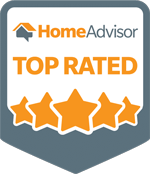 Your roof and siding can look new again! Inexperienced pressure washer users can easily damage window screens. Often, screens tear easily, and pressure washing them too harshly results in ripped screens. To avoid this, use the proper pressure washer tip at a distance that won’t be too harsh on your screens. Using high pressure in a window well is another rookie mistake. This typically blows debris everywhere, adding more work to the job. Use a gentle spray to wash in these areas, if needed. 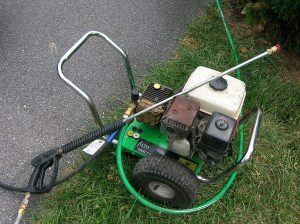 Pressure washers come in all shapes and sizes. Many times, homeowners are not satisfied with the results of their wash because they have chosen a machine that is too small for the job. Are you cleaning your small patio? An electric power washer may be sufficient. Is your house a 5,000-square-foot 2-story? You’ll probably need a gas-powered or professional-grade power washer to get the results you want. As you wash, it’s essential to choose not only the best machine, but the right nozzles for the job. Try a nozzle with a wider fan pattern before using a narrower one. The 0 degree nozzle should be reserved for only the toughest jobs. Follow the manufacturer’s instructions closely to avoid damaging paint or stone with too much pressure. Keep the nozzle moving and keep it the recommended distance from the surface. Maintain a safe environment for your pressure washing project. Too often, homeowners try to rush to complete the job, and they put themselves in unnecessary danger in the process. Check the area you will be washing for electrical wires, exterior outlets, power lines or other electrical concerns. Avoid blasting these areas. Keep in mind that you are using water, which does not mix well with electricity. The other common danger is gravity. It is often necessary to use a ladder to reach all the areas you are pressure washing. Make sure your ladder placement is stable. Don’t try to over-reach while on a ladder. Use proper footwear for climbing a ladder. Don’t take shortcuts that might result in a fall. To easily avoid all of these concerns, let the pros handle your pressure washing in North Royalton, OH. The experts at Central Window Cleaning will apply industry-leading knowledge and techniques to pressure wash your home and concrete areas. We use top safety measures and professional skill to ensure the project goes smoothly and has impeccable results. Our trusted technicians will revitalize your exterior and restore it to its former brilliance. For a free estimate for pressure washing in North Royalton, OH, contact Central Window Cleaning today.